Grand Finishes » How Long Can Wood Last? 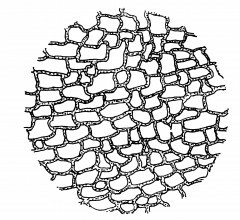 The honeycomb structure of wood as seen under a microscope. Wood would last forever except for one thing – wood decay, which is caused by only one thing…a wood-destroying fungi. This fungi can start in on a tree while the tree is still alive, although generally it invades the wood once the tree is dead. In your own home, when you see mold or stains…that is the fungus at work. It grows and thrives in dampness. Ironically if the wood is completely submerged in water or exists in a absolutely dry situation, then it will last forever…well, a really long time. Case in point: a log was found while a tunnel was being dug out in Washington. One of the foremen was intrigued enough by the look of it to send it to a lab for identification. It turned out to be an extinct species of sequoia that existed on this planet 12 million years ago! Consider wood as our ancestors did as the ideal building material. Nikitas, Matthew (2000). Grand Finishes For Carpentry: Molding Installation Projects (pp. 41-42). New York, NY: St. Martin’s Griffin.